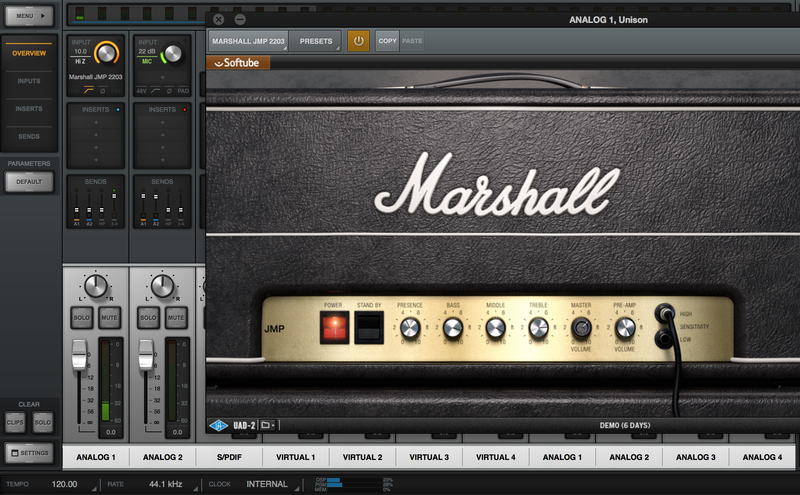 Marshall JMP 2203, Software Amp Simulator from Universal Audio in the UAD Plug-In series. Universal Audio has an ongoing partnership with the software whizzes at Softube to develop plug-ins for its UAD platform. 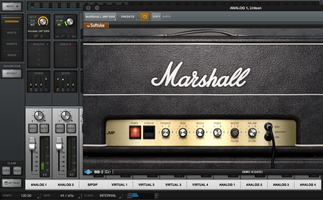 This collaboration has resulted in many different plug-ins, including models of several Marshall guitar amps. 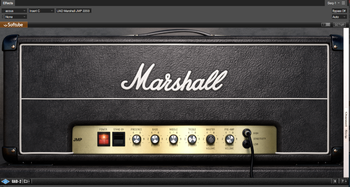 The latest is the Marshall JMP 2203 Plug-In, which was released recently along with UAD 8.5 software. We took it for a test drive. 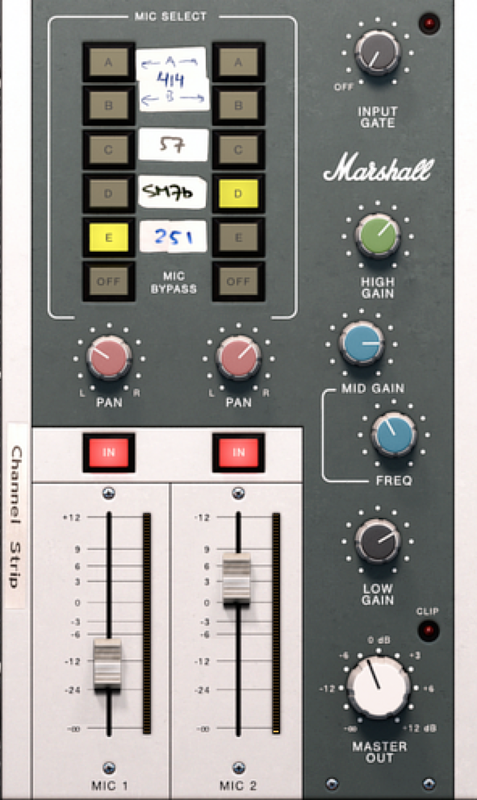 The JMP 2203 plug-in (Mac/PC), which supports VST, RTAS, AAX 64, and AU formats, was modeled from a JMP 2203 in Marshall’s own amp collection (aka "The Marshall Museum"). The cabinet used during the modeling process was a 4x12 Marshall 1960B with Celestion GT12-75s in it. The plug-in faithfully recreates the controls from the original amp. These include (from left to right) Presence, Bass, Middle, Treble, Master volume, and Pre-Amp (gain). Like the actual amp, two input jacks, High and Low, offer different amounts of “Sensitivity,” i.e., gain. You can switch input jacks by clicking on the virtual patch chord or the empty jack. Like the previous UAD/Softube Marshall models (Plexi Super Lead 1959, Bluesbreaker 1962 and Silver Jubilee 2555) the JMP 2203 plug-in features a Channel Strip section, which functions as a mixer that comes after the amp in the signal chain. Here you can manipulate virtual miking as well as boost or cut level and add additional EQ. Both mics can be used simultaneously, or you can bypass one or both. For each mic, you have the choice of a modeled Telefunken 251 tube condenser, one of two AKG C-414’s (presumably at different mic positions), a Shure SM57, or a Shure SM7B (an omni dynamic mic). According to SoftTube, during the modeling session, all the mics were placed close to the cabinet with the exception of the 251, which was used as a room mic. Each virtual mic’s output can be panned to create larger sounds when you use a stereo (or mono-to-stereo) instance of the plug-in, which is recommended by the developer. I found that having all the choices provided a lot of sonic options. However, unlike in many amp-modeling plug-ins, you have no control over mic placement — what’s there is what you get. Nevertheless, you can make significant tonal changes just via the mic combinations you choose. What’s more, having the additional EQ and volume controls in the Channel Strip is handy. I found, for example, that some of the low-gain sounds, which featured the Low input and moderate settings on the Master and Pre-Amp gain controls benefitted by the extra volume you could give them with the Master Out knob in the Channel Strip. What’s more, a noise gate is included in the channel strip, which you’ll likely need on really high-gain sounds, especially if you don’t have humbuckers or other noiseless pickups. I did notice a difference when playing through the plug-in when it was in the Unison input in Console. Both guitars I tried it with, a Fender Telecaster and an ESP 400-Series Strat-style guitar with Fender Lace Sensor pickups, sounded and felt more like they were going through a real amp. I wouldn’t necessarily describe the difference as “profound” however, but I say that in a positive sense, because to my ears, the plug-in also sounds quite good as an insert on a DAW channel. Here’s an example that was tracked with a Tele through a Unison input of Console. Here’s a similar example with the JMP 2203 plug-in inserted in a DAW channel. When reading through the manual (which is accessible right from the plug-in, yay UAD! ), I discovered that UAD recommends using the JMP 2203 in either a mono-to-stereo or stereo configuration, so that you can take advantage of the panning between mics. But, as you read in the quote from the manual that was included earlier in this review, it also says that the way to get the optimal sound is through the Unison insert in the Console application. So I figured there must be a way to get a stereo output when using the plug-in in the Unison slot of the Console software, right? Well, actually, no. I tried and tried to figure out a way to do this, but could only manage to output a mono signal to my DAW. I contacted Universal Audio to check this, and a spokesperson there confirmed that if you want mono-to-stereo operation, you can’t do it through Console. Instead you have to use the plug-in in one of your DAW's channel inserts or pre-fader in one of its aux send inserts. UAD plug-ins generally have very good documentation, but in this case, the manual sowed confusion rather than adding clarity. A tweak of the wording would be helpful. Like with an actual Marshall JMP 2203, the plug-in version is at its best on high-gain sounds. For instance, you can get some super heavy chugging rhythm sounds. Here’s a down-tuned Strat with the JMP 2203 inserted on it and the Pre-Amp knob turned up full. High gain lead sounds are also easy to obtain. Here are two examples, the first features a Tele through a crunchy lead sound recorded from the Unison input in Console. Here's the same patch, and a similar example, but this time the JMP 2203 was added via a DAW insert. Dialing in clean sounds takes a little more work on the JMP 2203 plug-in. Not only do you need to turn down the Pre-Amp knob, but also mess with the Bass, Mid and especially the Treble knobs to come up with a pleasing sound. Here’s one, recorded DI and with the plug-in inserted. As mentioned, the Channel Strip’s panning controls allow you to dial in wide stereo sounds if you want. Here’s an example on a crunchy rhythm part. This one, again with the Tele, used the JMP 2203 in an insert slot of the DAW. Having a volume control for each mic in the Channel Strip makes it easy to precisely control the sound, because you can dial in as much or as little of each mic as you want. Although you can’t change the mic placement, having the ability to mix the mic feeds is very helpful. 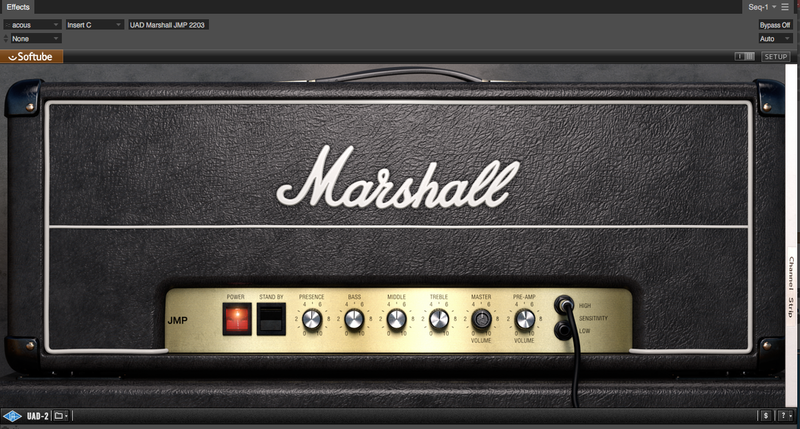 I was quite pleased with the sound of the Marshall JMP 2203 Plug-In ($199). If you’re looking for iconic Marshall tone, you will be too. 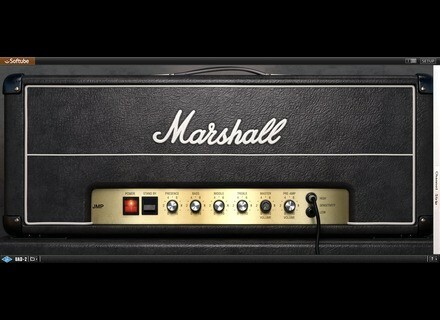 As with a real Marshall amp, the most compelling sounds are the distorted and crunchy ones. I love the variety of mic choices and the ability to individually control pan and volume for the mics. Going through the Unison preamp slot with an Apollo interface definitely adds a bit more realism to the playing experience and the lack of latency when connected that way is impressive. Still, the plug-in functions very well as a DAW insert, so you certainly don't need an Apollo interface to use it (although you need UAD hardware of some type to run the plug-ins). The JMP 2203, like the other UAD Marshall amp plug-ins, is in the high end of the price range for guitar amp models, but you’re definitely getting what you pay for: Pristine modeling from Softube and superb features.